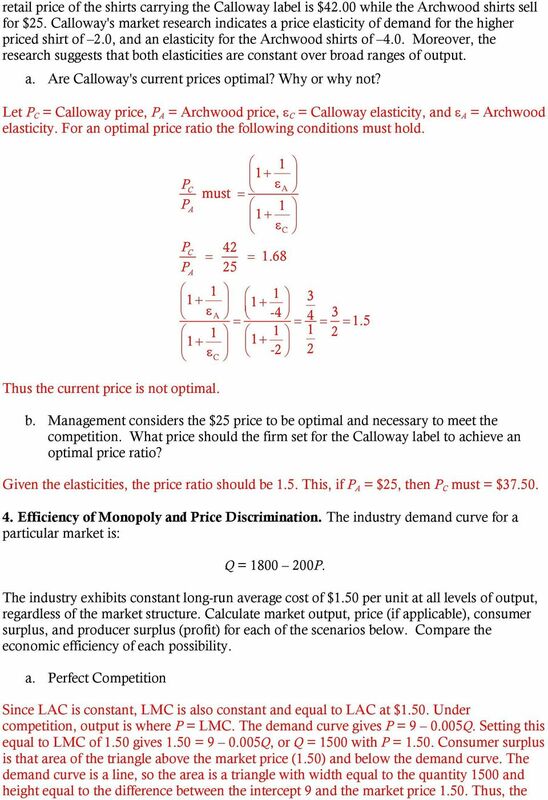 Download "Economics 201 Fall 2010 Introduction to Economic Analysis"
1 Economics 201 Fall 2010 Introduction to Economic Analysis Jeffrey Parker Problem Set #5 Solutions Instructions: This problem set is due in class on Wednesday, October 13. If you get stuck, you are encouraged to ask questions of the instructor or the tutors. Jeff has office hours Friday 1:00 2:00pm, Monday 3:00 4:00pm, and Tuesday 10:0 11:00am in Vollum 229. Tutors will be available at work sessions Monday and Tuesday 7 10pm in the Dorothy Johansen House. Individual tutoring (at no cost for up to one hour per week) can be arranged through the Office of Student Services. 1. Regulation of Monopoly. Regulus Grimm is a city planner in Reelihumid, Georgia, a medium-sized city. The city is considering a proposal to award an exclusive contract to Clear Vision, Inc., a cable television carrier. 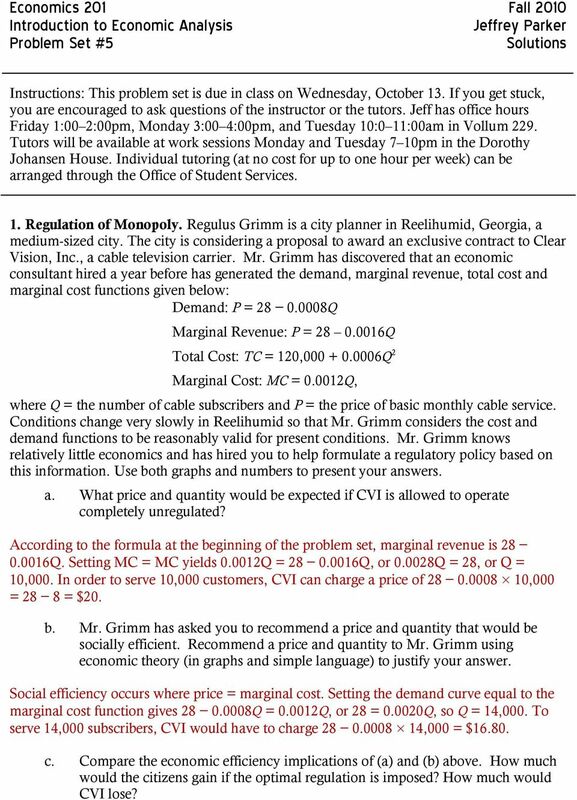 Mr. Grimm has discovered that an economic consultant hired a year before has generated the demand, marginal revenue, total cost and marginal cost functions given below: Demand: P = Q Marginal Revenue: P = Q Total Cost: TC = 120, Q 2 Marginal Cost: MC = Q, where Q = the number of cable subscribers and P = the price of basic monthly cable service. Conditions change very slowly in Reelihumid so that Mr. Grimm considers the cost and demand functions to be reasonably valid for present conditions. Mr. Grimm knows relatively little economics and has hired you to help formulate a regulatory policy based on this information. Use both graphs and numbers to present your answers. a. What price and quantity would be expected if CVI is allowed to operate completely unregulated? According to the formula at the beginning of the problem set, marginal revenue is Q. 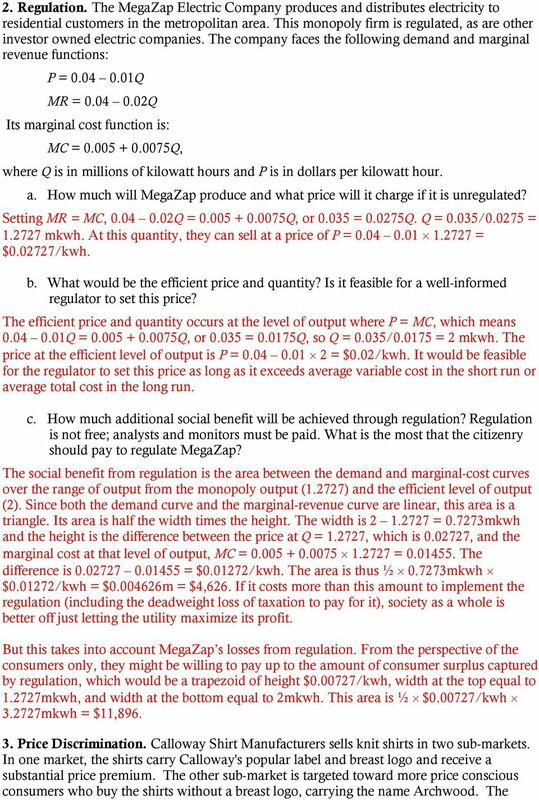 Setting MC = MC yields Q = Q, or Q = 28, or Q = 10,000. In order to serve 10,000 customers, CVI can charge a price of ,000 = 28 8 = $20. b. Mr. Grimm has asked you to recommend a price and quantity that would be socially efficient. Recommend a price and quantity to Mr. Grimm using economic theory (in graphs and simple language) to justify your answer. Social efficiency occurs where price = marginal cost. Setting the demand curve equal to the marginal cost function gives Q = Q, or 28 = Q, so Q = 14,000. 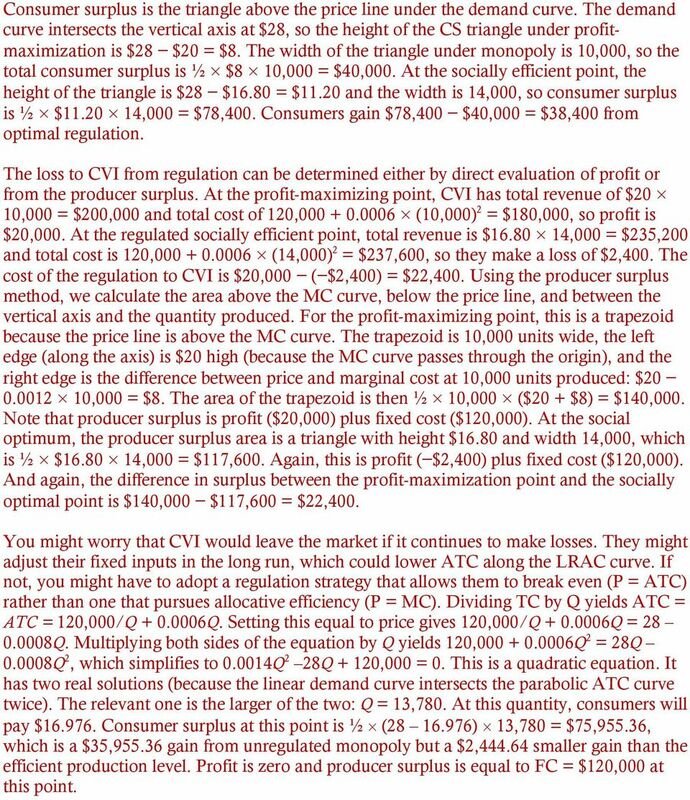 To serve 14,000 subscribers, CVI would have to charge ,000 = $ c. Compare the economic efficiency implications of (a) and (b) above. How much would the citizens gain if the optimal regulation is imposed? How much would CVI lose? 2 Consumer surplus is the triangle above the price line under the demand curve. The demand curve intersects the vertical axis at $28, so the height of the CS triangle under profitmaximization is $28 $20 = $8. The width of the triangle under monopoly is 10,000, so the total consumer surplus is ½ $8 10,000 = $40,000. At the socially efficient point, the height of the triangle is $28 $16.80 = $11.20 and the width is 14,000, so consumer surplus is ½ $ ,000 = $78,400. Consumers gain $78,400 $40,000 = $38,400 from optimal regulation. The loss to CVI from regulation can be determined either by direct evaluation of profit or from the producer surplus. At the profit-maximizing point, CVI has total revenue of $20 10,000 = $200,000 and total cost of 120, (10,000) 2 = $180,000, so profit is $20,000. At the regulated socially efficient point, total revenue is $ ,000 = $235,200 and total cost is 120, (14,000) 2 = $237,600, so they make a loss of $2,400. The cost of the regulation to CVI is $20,000 ( $2,400) = $22,400. Using the producer surplus method, we calculate the area above the MC curve, below the price line, and between the vertical axis and the quantity produced. For the profit-maximizing point, this is a trapezoid because the price line is above the MC curve. The trapezoid is 10,000 units wide, the left edge (along the axis) is $20 high (because the MC curve passes through the origin), and the right edge is the difference between price and marginal cost at 10,000 units produced: $ ,000 = $8. The area of the trapezoid is then ½ 10,000 ($20 + $8) = $140,000. Note that producer surplus is profit ($20,000) plus fixed cost ($120,000). At the social optimum, the producer surplus area is a triangle with height $16.80 and width 14,000, which is ½ $ ,000 = $117,600. Again, this is profit ( $2,400) plus fixed cost ($120,000). And again, the difference in surplus between the profit-maximization point and the socially optimal point is $140,000 $117,600 = $22,400. You might worry that CVI would leave the market if it continues to make losses. They might adjust their fixed inputs in the long run, which could lower ATC along the LRAC curve. If not, you might have to adopt a regulation strategy that allows them to break even (P = ATC) rather than one that pursues allocative efficiency (P = MC). Dividing TC by Q yields ATC = ATC = 120,000/Q Q. Setting this equal to price gives 120,000/Q Q = Q. Multiplying both sides of the equation by Q yields 120, Q 2 = 28Q Q 2, which simplifies to Q 2 28Q + 120,000 = 0. This is a quadratic equation. It has two real solutions (because the linear demand curve intersects the parabolic ATC curve twice). The relevant one is the larger of the two: Q = 13,780. At this quantity, consumers will pay $ Consumer surplus at this point is ½ ( ) 13,780 = $75,955.36, which is a $35, gain from unregulated monopoly but a $2, smaller gain than the efficient production level. Profit is zero and producer surplus is equal to FC = $120,000 at this point. 5 area is ½ $ = $5,625. Producer surplus is zero because the marginal-cost (supply) curve is horizontal at the market price, so there is no area. b. Pure Monopoly (Hint: MR = Q) A monopoly firm will set MR = LMC, or Q = 1.50, or Q = 750. Price is = $5.25. The consumer surplus is the triangle above 5.25 and below the demand curve from output of zero to 750. 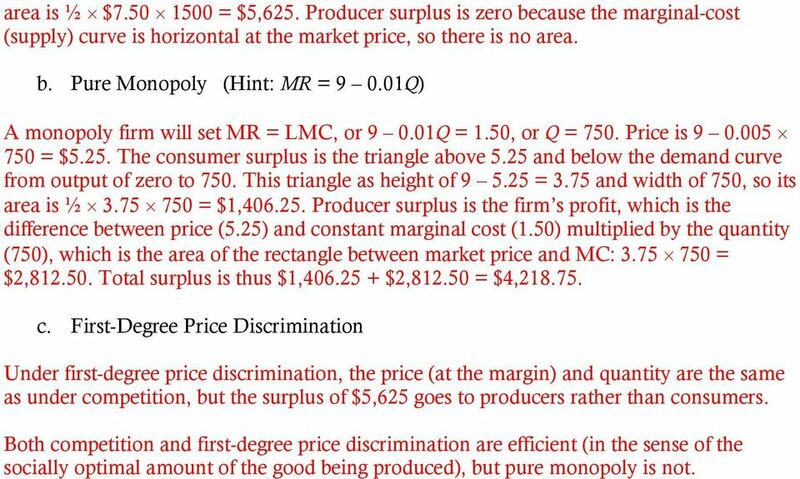 This triangle as height of = 3.75 and width of 750, so its area is ½ = $1, Producer surplus is the firm s profit, which is the difference between price (5.25) and constant marginal cost (1.50) multiplied by the quantity (750), which is the area of the rectangle between market price and MC: = $2, Total surplus is thus $1, $2, = $4, c. First-Degree Price Discrimination Under first-degree price discrimination, the price (at the margin) and quantity are the same as under competition, but the surplus of $5,625 goes to producers rather than consumers. Both competition and first-degree price discrimination are efficient (in the sense of the socially optimal amount of the good being produced), but pure monopoly is not. WSG7 7/7/03 4:36 PM Page 95 7 Profit and Revenue Maximization OVERVIEW The purpose of this chapter is to develop a general framework for finding optimal solutions to managerial decision-making problems.